Jon Athan: "10 Days: Undead Uprising" is now available for pre-order! "10 Days: Undead Uprising" is now available for pre-order! Today, I am proud to announce my latest book. 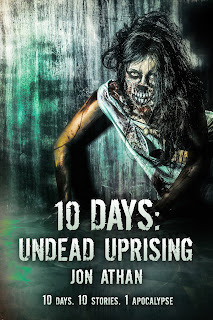 10 Days: Undead Uprising is now available for pre-order exclusively on Amazon.com! This new zombie anthology releases on October 15th, 2015 for $3.99. On release, you'll also be able to read the book as part of your Kindle Unlimited subscription. Regardless of your method of readership, thank you for the support. Day 1 follows a mad scientist as he inadvertently causes the undead uprising while trying to revive his deceased wife. Day 2 follows a young girl left home alone to take care of her bedridden grandfather; the shambling in the room shatters her serene night. Day 3 follows a little boy trying to take a peek at Santa Claus with monstrous results. Day 4 follows two police officers raiding a drug house, completely unaware of the outbreak. Day 5 follows scientists in a secret laboratory as they race to find a source and cure for the disease. In order to avoid spoilers, you'll have to read the book to find out what happens in Days 6 through 10. Anyway, thank you for reading. This is my most ambitious book yet. I wanted to create a unique yet familiar zombie apocalypse — something that would make you comfortable, then shock you a bit. I genuinely hope you enjoy the book. It's a product of my passion for storytelling and horror.